Just as we start recuperating from our busy holiday season we realize that all the big football parties are around the corner…and food is pretty much the best part of it! I do not watch football. I tried…many a times…and it was an epic fail. So I quit. I do however watch the Superbowl commercials. 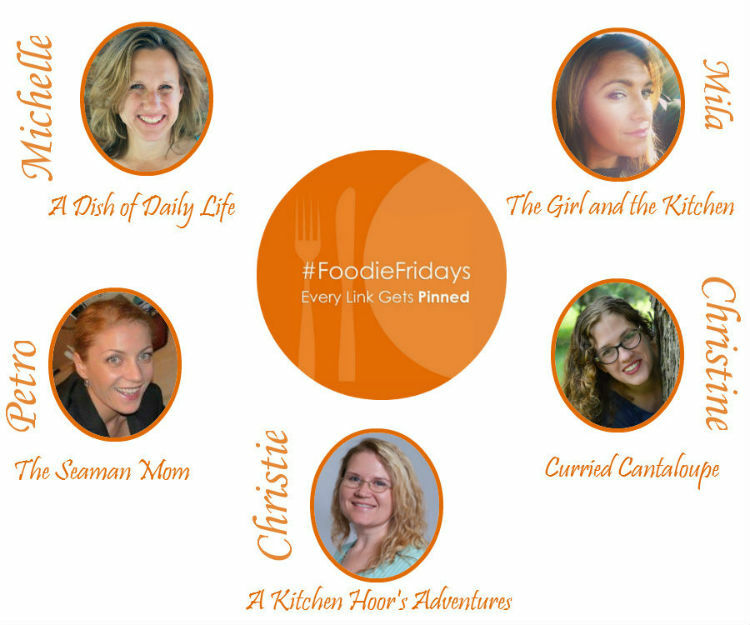 but FIRST a few announcements to some FABULOUS CHANGES happening here at #Foodie Fridays! Foodie Fridays is about to become Foodie Fridays and DIY! Many of the other food parties are accepting DIY as well now, and so many of you have been linking up DIY projects, that we just decided that it makes more sense to add DIY than it does to keep it to just recipes. We’d also like to change the Foodie Fridays (and now DIY) board to a group board and open it up to all of you! After you link up, add or schedule your links to the board. There will be a few rules, which will all be listed on the board. They’re pretty standard. Spammers will be deleted though, so please stick to the rules. For those of you reading this now, after you link up, send me an email at mila@https://girlandthekitchen.com to request your invite.You must be following me on Pinterest in order for me to add you, and you will need to also follow all of the other co-hosts on Pinterest as well. In the subject line of your request, put: Requesting Invite – Foodie Fridays and DIY Group Board. That’s it guys!!! Let’s get a reading! I am a huge fan of wings…I mean HUGE. And for me no game day party is complete without them! And being on an extremely low carb high fat ketogenic diet, I can actually eat them WITHOUT feeling guilty! WIN! I actually got a bunch of wings sent from Omaha Steaks and I made a pretty mean dip and slaw for them…WHICH IS HEALTHY! Yup! HEALTHY! Speaking of wings… Christine from Sprinkle of this and that has a great recipe for Baked Parmesan Garlic Wings…Those seem like they are calling my name. Cue lip licking. I love pizza for the game…but sometimes people just want a BITE of something… And these Italian Sausage Cannoli from Eat it and Say Yum. They kind of look like bagel dogs…but yummier and pizza like. LOVING THIS! And a party is just not complete without a dip right?! I mean come on! And I do love a cheesy spinach dip…this one from Christy’s Cooking Creations look spot on! Since I am uber low carb now…I have an issue with breading on crispy chicken. But it looks like The Chunky Chef has used one of my fave techniques for breading on these chicken fingers! And it makes these perfect low carb munches for all the people who are dieting…ahem me. Let’s not forget dessert. Dini from Giramauk’s Kitchen has an INCREDIBLE dessert! Caramelized Hazelnut Praline Chocolate Mousse is flipping incredible! What does not sound good about that? That’s all guys!!! So, make sure you stop by their blogs, check out their boards, and see who they featured this week. Visit Mila Furman’s profile on Pinterest. Thanks for linking with us Leia!!! So many great links, thank you for hosting. So many fantastic recipes to choose from ! Definitely trying the Italian Sausage Cannoli and red fruit salad! I know Mira right! She did such a great job with that cannoli! Thanks for featuring the Three Cheese Spinach Dip! All those party foods look so amazingly delicious! Have a great weekend Mila! Christy thank you so much for sharing with us at #foodiefriDIY! Thanks so much for the feature Mila! You are right! Game Day treats are the best!!! You are welcome! Thank you so much for always sharing with us!